Choosing and signing a contract with a commercial cleaning service takes research, reading reviews, and understanding specifics about the company. However, it can be difficult sometimes getting to know individual companies without having a real conversation with them. 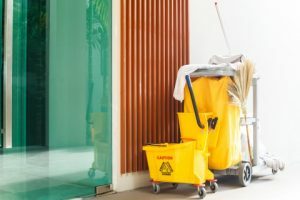 If your company is in the process of hiring a janitorial cleaning company, here are some tips on what to ask them so you can be confident knowing you are getting the best. This may be one of the more important questions to ask given that the answer can protect you, your employees, and your business. If the company is not insured, this could mean that if an accident were to happen involving one of their employees, you would be responsible. Or if something in your office, airport, or school was damaged, it would not be the company’s responsibility to pay for the damage. There are four types of insurance that a cleaning company should have. General Liability Insurance – This will protect your company from negligence or wrongdoing by the cleaning service. Workers Compensation Insurance – This type of insurance will cover accidents that injure or disable an employee of the cleaning company. This includes job-related incidents that occur on the job itself or even driving to the facility. Automobile Liability Insurance – In order to protect your company’s assets, this type of insurance protects the cleaning company’s auto fleet that is used to drive to and from your office. Umbrella Policies – To make sure everything is covered, an umbrella policy covers anything beyond the three previous mentioned insurance types. This will protect against events that could cost a significant amount of money, including potential legal fees, that could be incredibly damaging to your company if the cleaning service does not have this type of insurance. Do You Have Quality Control Checks? To ensure that jobs are done correctly and thoroughly, a quality control check process should be in place and used with every job. With a janitorial inspection, a commercial cleaning service will be able to see what, if anything, was missed and how to improve so that it’s not missed the next time. This is also an excellent time to ask how managers communicate with the staff that works in offices day to day. If a cleaning opportunity was missed, documenting the issue is a start, but it needs to be communicated to the staff. A company who uses technology and communication systems to their advantage will have a much easier time staying ahead of problems or issues that arise. Do they reuse plastic trash liners that haven’t been dirtied with food or drinks? Do they use recycled hand towels or towels made of a recyclable material? Do they use microfiber rags instead of disposable towels? Do they have vacuum cleaners with HEPA filters? These green practices will help limit the amount of plastic used in the facility, increase a number of materials used that can be recycled or reused, will help your company save money when cleaning materials don’t need to be ordered as often and will provide you with a cleaner, safer facility. By avoiding cleaning products that have toxins and harmful chemicals and using water-based solvents and energy-efficient equipment and tools, the health, cleanliness, and efficiency of your company will improve. How do You Screen and Train Employees? When hiring a commercial cleaning service, you’re not only hiring the company but each individual employee. When you hire for your own company, there are probably requirements for each employee. The same goes for a janitorial company. To make sure that everyone working in your office has met certain requirements, it’s important to ask about the hiring and training process. Is there a drug test and background check? Do they check employee’s references? Training is also an essential question, especially for certain types of businesses. You want to know that those who are working at your facility can provide you with an incredible clean and have the necessary tools and knowledge at their disposal. There should be basic training that includes standard tasks, but for medical cleaning, schools, or airports, there may be more specific training that is needed to ensure each job is done correctly and thoroughly. Ask specific questions that relate to your business. This doesn’t necessarily have to be a deal breaker, but a cleaning company with experience may perform better and have fewer cases of miscommunication or cleaning errors. This will also depend greatly on the type of industry your business is in. A startup airport cleaning company will have a harder time getting started than a standard office cleaning company. With an experienced company, you can be confident knowing that they will come in and get the job done right and be able to provide a level of service and customization that may not be possible with a new company. A communication plan between a business and their cleaning company will ensure that nothing is missed and everything is completed as desired. After the initial walk through the janitorial service should provide contact information for each person involved with your account. If you have simple billing questions, staff at their office may be the ones to go to. 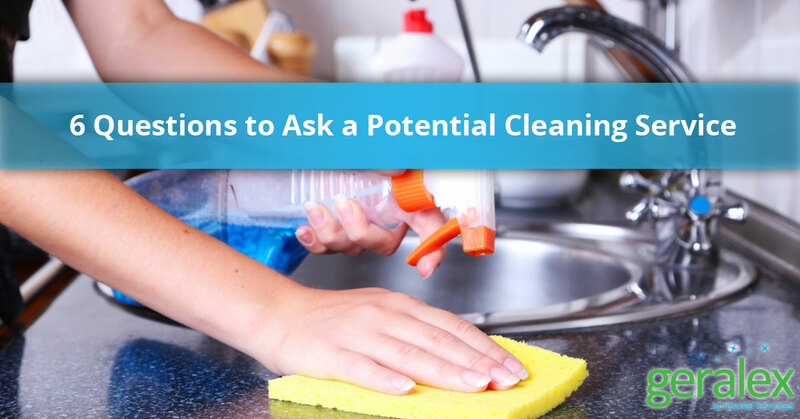 For more in depth cleaning requests, there should be one point of contact that you can easily reach out to. Whatever the process is, be sure that everything is clear so if problems arise, they can be resolved quickly. Get to know the staff at Geralex in Chicago today. Our commercial cleaning service wants to provide your company with superior cleaning. Whether your business is a school, airport, or in a typical office setting, our knowledgeable and experienced employees can take the stress of cleaning off of your shoulders. Our priority is the health and cleanliness of your facility. That’s why we use eco-friendly products and have green practices in place that will save you money and protect the environment. Give us a call today and feel free to ask us as many questions as you can think of.